Baton Rouge, LA – January 28, 2014 – Local personal injury attorney Gordon McKernan is making a major statement in Baton Rouge, thanks to new 3D billboard embellishments from Lamar Advertising Company. Lamar Advertising started producing custom 3D objects at its printing facility in Baton Rouge last year, and McKernan took advantage of this opportunity for his new campaign concept. Using its 3D production capabilities, Lamar Advertising created a 16-foot tall, 200-pound larger-than-life realistic foam cutout of Gordon McKernan and a 12-foot wide, 300-pound truck. 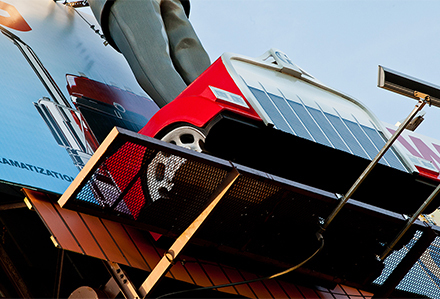 The 3D foam props were secured to the billboard structure, creating a bold, impactful design. 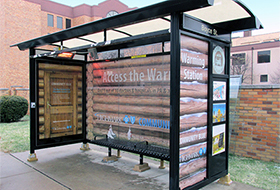 “Lamar Advertising came up with the 3D billboard concept, and I thought it was a great idea. I am eager to try new trends so that my law practice can be as innovative as possible,” says Gordon McKernan. 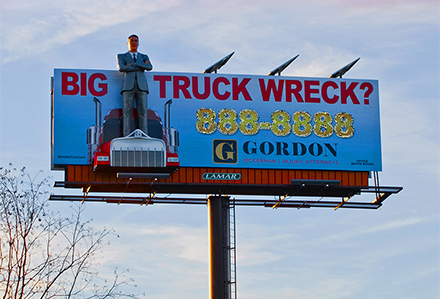 A larger-than-life 3D rendition of Gordon McKernan (16-foot tall, 200-pound) stands on top of a truck (12-foot wide, 300-pound) extending off Lamar Advertising’s billboard space in Baton Rouge. Close-up of 3D foam extensions on billboard. The 3D billboard stands between the exits of College and Acadian on I-10 west bound. Gordon McKernan Injury Attorneys is a personal injury law firm based in Baton Rouge, Louisiana specializing in car and motor vehicle accidents. For over 20 years, the firm has represented victims across Louisiana, including Baton Rouge, Lafayette, New Orleans, Houma and Lake Charles. For more information, please visit www.getgordon.com. Lamar Advertising Company (Nasdaq: LAMR) announced today that its wholly owned subsidiary, Lamar Media Corp., has closed its private placement of $510 million in aggregate principal amount of its 5 3/8% Senior Notes due 2024. The proceeds of this offering to Lamar Media, after the payment of fees and expenses, were approximately $502.3 million.